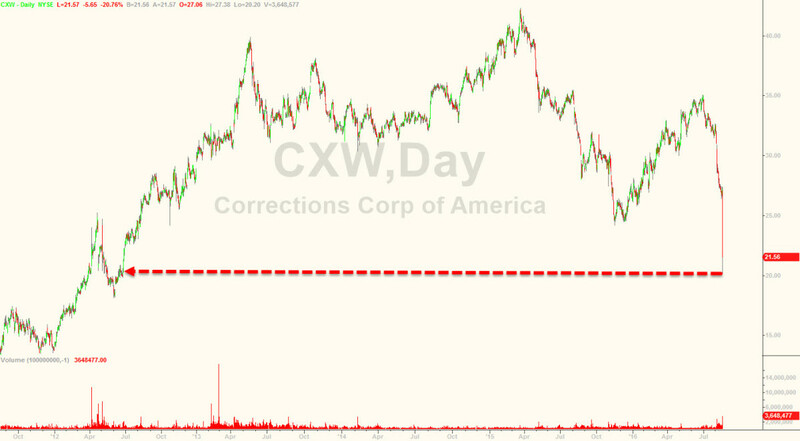 As soon as the news broke the DOJ would be abandoning for-profit prisons, stock value crashed for both Corrections Corporation of America and the GEO Group. Deputy Attorney General Sally Yates speaks during a news conference at the Justice Department in Washington. The Justice Department says it’s phasing out its relationships with private prisons after a recent audit found the private facilities have more safety and security problems than ones run by the government. In a stunning turn of events, the U.S. Department of Justice announced Thursday it will no longer use private prisons to incarcerate federal prisoners, deeming the notorious for-profit facilities both less safe and less effective in providing correctional services than those operated by the government. “They simply do not provide the same level of correctional services, programs, and resources; they do not save substantially on costs; and as noted in a recent report by the Department’s Office of Inspector General, they do not maintain the same level of safety and security,” Deputy Attorney General Sally Yates explained in today’s announcement. According to the Washington Post, a memo from Yates instructs officials to either decline to renew private prison contracts upon their expiration, or “substantially reduce” the contracts’ scope. This announcement comes on the heels of a rather scathing report from the DOJ’s inspector general last week which found the nefarious privately-run facilities had a greater number of safety and security incidents than those run by the Federal Bureau of Prisons. “The fact of the matter is that private prisons don’t compare favorably to Bureau of Prisons facilities in terms of safety or security or services, and now with the decline in the federal prison population, we have both the opportunity and the responsibility to do something about that,” asserted Yates in an interview, according to the Post. 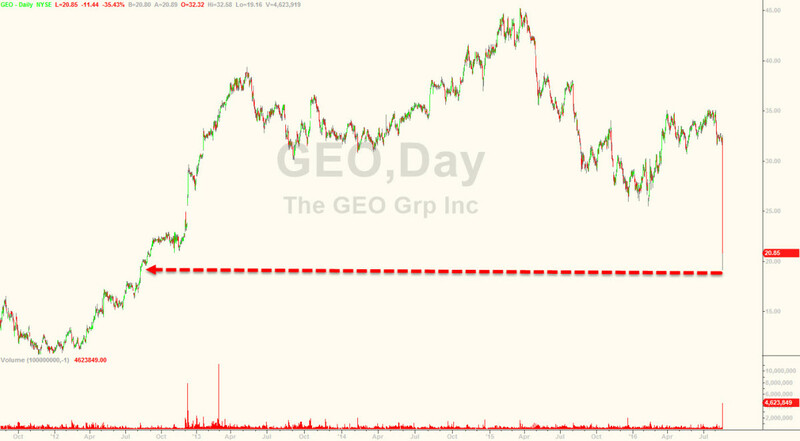 As soon as the news broke the DOJ would be abandoning for-profit prisons, stock value crashed for both Corrections Corporation of America and the GEO Group, as Zero Hedge reported, the latter evaporating 35 percent of its value in record time. 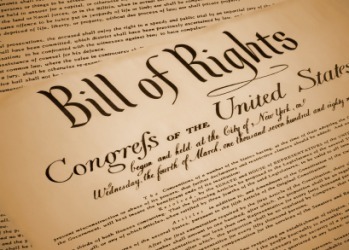 Countless advocacy groups and media outlets, including The Free Thought Project, have frequently highlighted countless abuses, violence, and horrid conditions, if not outright human rights violations — as well as numerous deaths under suspicious circumstances — found in notorious for-profit prisons. Toward the goal of severely constricting private prison contracts, Yates noted the bureau had already declined to renew a 1,200-bed contract for Cibola County Correctional Center in New Mexico, despite protestations from the sheriff. She also wrote that over the next year, the Bureau of Prisons would decline to incarcerate prisoners in at least three private facilities, and by May 1, 2017, the private prison population would be drastically reduced to just 14,200 inmates — in total. Though ceasing to house federal prisoners in privately-run facilities will be a major undertaking, the move is now underway. “We have to be realistic about the time it will take, but that really depends on the continuing decline of the federal prison population, and that’s really hard to accurately predict,” Yates explained. 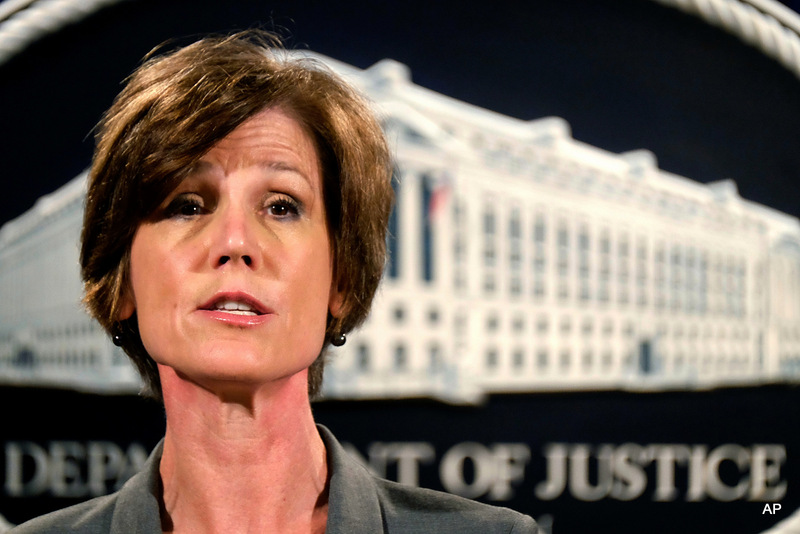 While private prisons might have been useful in supplementing federally run facilities for some time, Yates noted they had proved less effective over time. As for the cost of private prisons, the inspector general found that in 2014, the Bureau of Prisons shelled out $639 million to the private companies: Corrections Corporation of America, GEO Group and Management and Training Corporation. Given the safety, security, and financial concerns — not to mention countless evidence of outright abuses — surrounding for-profit prisons, the DOJ announcement is welcome news to both inmates, advocates, and taxpayers, alike. 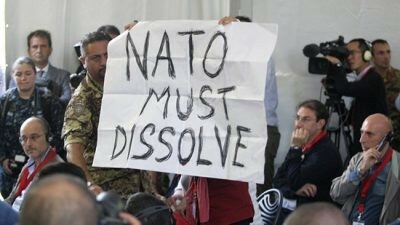 This article first appeared at TheFreeThoughtProject.com.